If you were building executive-class cars in the UK during 1963, the message emanating loudly from that year's Earls Court Motor Show was "lift your game". On the Standard-Triumph stand and across the floor at Rover, two brand-new designs were making mainstream Ford Zodiacs, Vauxhall Crestas and Austin Westminsters look old and very ordinary. Rover's contender was also badged as a 2000, but it would be the more conservative and practical Triumph 2000 that would really set cash registers singing. During the following 15 years, almost 320,000 six-cylinder Triumph sedans were made, including 55,000 fuel-injected PIs. Their styling was modern, airy and interesting - a collaboration between Triumph designers and Italian stylist Michelotti that took just two years to develop from concept to production-ready. Its six-cylinder engine had already proven its durability in the company's Vanguards, so was left pretty much alone. Twin carburettors increased power from 60kW to 67kW, with fuel injection and increased capacity eventually pushing it to 98kW. Weight savings and low gearing produced snappy acceleration when compared to the hefty Vanguard. Top speed from a 2000 manual was around 150km/h, with the automatic 10km/h slower. Manual cars were offered with an optional overdrive that allowed them to cruise easily at 130km/h on the UK's growing motorway network. 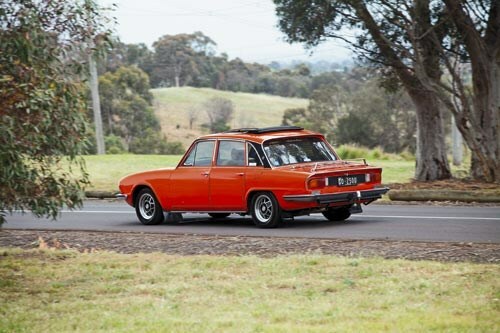 Local 2000s were assembled in Melbourne by Australian Motor Industries (AMI), alongside Toyotas and Ramblers, with a colour palette shared between AMI's various brands. 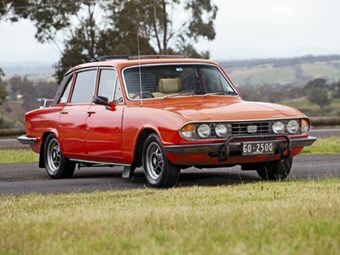 Local content including labour, trim, paint and tyres gave the Triumph a price advantage over the fully-imported Rover and put it into direct competition with Holden's EH Premier. Although down on power, the 2000 excelled in comfort and sophistication. Where the EH had rear 'cart' springs and dreadful drum brakes, the Triumph employed an independent rear-end and Macpherson struts at the front with power-assisted front discs. A heater/demister was standard, as were reclining and very comfortable front bucket seats. AMI attempted to boost the Triumph's prestige credentials by building around 100 of its own 2000MD model. These came initially with wire-spoke wheels, triple Stromberg carburettors and overdrive, and are now very scarce. Carbodies in the UK produced an estate (station wagon) version but these weren't sold new in Australia. Chasing cheap performance for its TR5 sports car led Standard-Triumph to fatefully adopt Lucas fuel-injection. Using a detuned version of the TR5 engine, the 2.5 PI sedan launched here in 1969 and was lauded for its 170km/h performance. But it was derided shortly after for appalling reliability. The PI introduced metallic paint to the Australian Triumph range, accompanied by vinyl-covered C-pillars and Rostyle wheel covers. 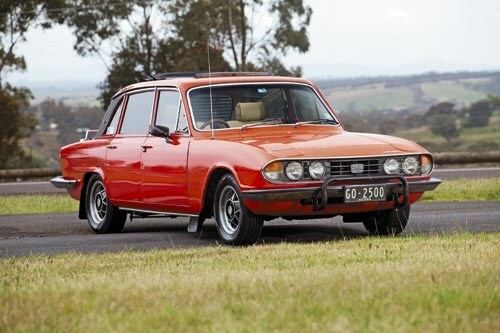 In May 1970, the Mark 2 version was introduced featuring an elongated nose that echoed the new Triumph Stag, rectangular taillights and new bumpers. Initially the range comprised 2000 and 2.5 PI models, but in March 1973, a 2500TC (twin-carburettor) model was added. In addition to the bigger engine, minus the tribulations of the cantankerous Lucas fuel injection, the TC sported improved seats and optional power steering. Power was boosted to 75kW and even automatic versions could reach 160km/h, thanks to revised gearing. Triumph gave up on the fuel injected PI in mid-'75 and by 1976, only the 2500TC remained. But a flagship Triumph was revived in June '77 - the 2500S. 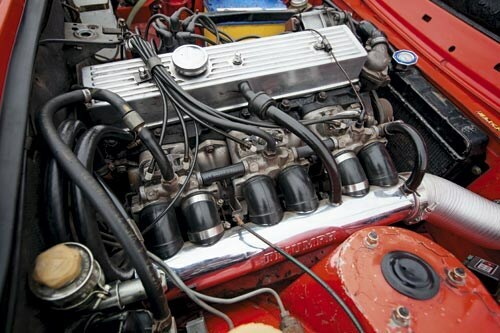 Its engine was shifted marginally sideways to provide clearance for larger SU carburettors and a new exhaust manifold, but with power boosted by just 5kW, the effort seemed hardly worthwhile. Under the 2500S nose was the first anti-roll bar fitted to these cars, combined with bigger tyres on Triumph Stag-style 14-inch rims. 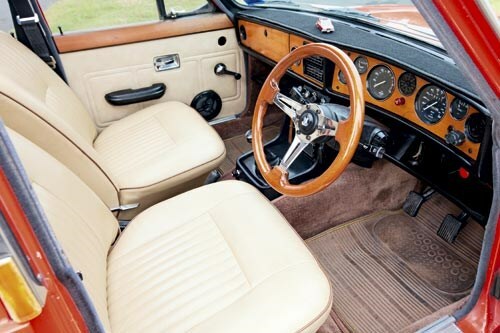 Power steering became standard with the 2500S, and air-con and even a sunroof were optional. All models were discontinued by the close of 1978. Having owned two and driven most 2000 and 2500 Triumph variants, my commentary might struggle a bit in the area of objectivity. However, these truly are good cars and very underrated. The first thing you notice is all-'round visibility and the quarter vents which survived all the way to the final 2500S - compensating for pretty ordinary ventilation. Vinyl seat trim used in early versions will become 'ouchy' after a few hours parked in summer sun, so shorts-wearers might prefer '70s models with cloth trim. Low-geared steering combined with a massive steering wheel can make early cars feel cumbersome, but stylish aftermarket wheels remain available and transform the driver's relationship with the car. My 1969 model was enhanced by wider wheels with 185/70 radials, upgraded dampers and some suspension tweaking by the celebrated Allan J. Heasman. At a time when Australia was converting to metric (though my speedo and brain hadn't), it was easy to forget that advisory signs were now showing km/h rather than mph. The Triumph didn't care either and confidently scuttled through bends 60 percent faster than was recommended. Ride quality, providing you don't go too extreme with the suspension fiddles, is brilliant. The downside of long-travel springs is body roll which manifests more obviously in early cars than the later ones with their wider rear track. Keeping the back-end under tighter rein had the effect of reducing oversteer but also made Mark 2 versions less responsive to throttle and steering inputs. Don't be scared of taking your Triumph for a gallop through the unsealed countryside either. Unlike most models of their age, these cars lap up the rough stuff and handle corrugations with the same disdain as similarly-suspended Datsuns. In 1970, two Mark 2 PIs distinguished themselves by finishing second and fourth in the incredibly tough World Cup Rally. 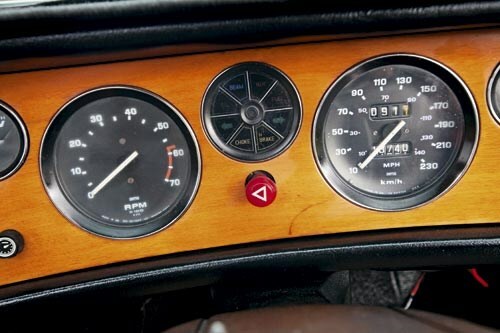 Acceleration, even from manual cars, isn't startling and carb-fed automatics can be downright turgid. Not surprisingly, the owner of our featured PI Mark 2 elected to have its original auto transmission replaced (at some expense) by a manual/overdrive. Four-speed fuel economy can better 10L/100km but an auto used primarily in city traffic is likely to consume around 13. The fuel tank holds a generous 64 litres. Overheating and blown head gaskets were a problem with early models. Neglected servicing can hurt crankshaft bearings so listen for rumbling when the engine is cold and kettle noises from the radiator when it's hot. The most frustrating aspect of acquiring a 2000/2500 will be prising an excellent car from the grasp of its doting owner. Really good examples rarely make their way into the classifieds and you either need to keep an eye out at British vehicle display days or join a club. "Most of the very good cars are owned by club members and that's where to go if you want one," PI Mark 2 owner Graeme Oxley advises. "You want a car with good history that's sound in the body and has a decent interior. Virtually everything mechanical can still be bought for them and there are specialists in Sydney, Melbourne and Brisbane who know how to keep them running really well." The majority that appear in the open market need work and are generally priced at less than $2000. Getting one of these into useable condition can easily absorb as much money as an excellent 2000 or 2500TC will cost to buy and enjoy immediately. Authentic PIs of either series can get expensive and a Mark 1 car was offered at more than $20,000. Expect to pay $12-15,000 for one in excellent - and reliable - condition. Solid construction with a minimum of rust traps helped Triumphs survive for longer than many British designs, but time and neglect both take their toll. Check wheelarches for filler, bubbling around the windscreen rubbers, then look at the sills for bubbles or shonky repairs. More serious problems affect top suspension strut mounts and attachment points for the rear axle assembly. Make sure that the front-hinged bonnet closes squarely and the boot seal isn't allowing water into the luggage area. Early bumpers in good condition aren't easily found so watch for dents and peeling chrome. Other parts including light units, lenses, badges and bumpers for Mark 2s are still available new. Triumph engines are simple, durable and cheap to fix if they do eventually wear out. Exhaust smoke at start-up can signify valve stem leaks but a sustained blue haze means worn piston rings or liner damage. Top-end rattles can result from blocked oil ways leading to rocker shaft wear. Look and listen for exhaust manifold leaks and cracks. Check that the viscous-coupled fan on later cars still displays resistance when spun by hand. The fuel-injection system on surviving PI cars should by now have been upgraded using components not supplied by Lucas. Overdrive cars aren't common in Australia but make sure that the engine speed drops when O/D is engaged. Advanced for its time, the Triumph suspension is tough and pretty simple to maintain. The only major weakness was sliding-joint half-shafts which seize. These can be modified by Triumph specialists to take more durable Datsun shafts. Listen for clicks and clunks from the rear when accelerating or cornering. Worn steering rack bushes send road shock through the column and the lower joint can wear, leading to excessive play at the rim. Tired seat trim will need to be replaced second-hand or by a trimmer, but brand new carpet sets, sunvisors and door seals are available. Dash veneer splits with age and one supplier in the UK was asking $700 for a kit of replacement timber items. Replacing the early generator with an alternator is advisable and make sure that the column stalks on Mark 2 cars haven't been broken and crudely repaired.